Not every Mac user will use the Handoff feature or want to keep it enabled, particularly if you share a Mac with a single login with other devices in the same household, then you may find Handoff to be unnecessary or unwanted as the little Handoff app resume icon appears in the Dock. 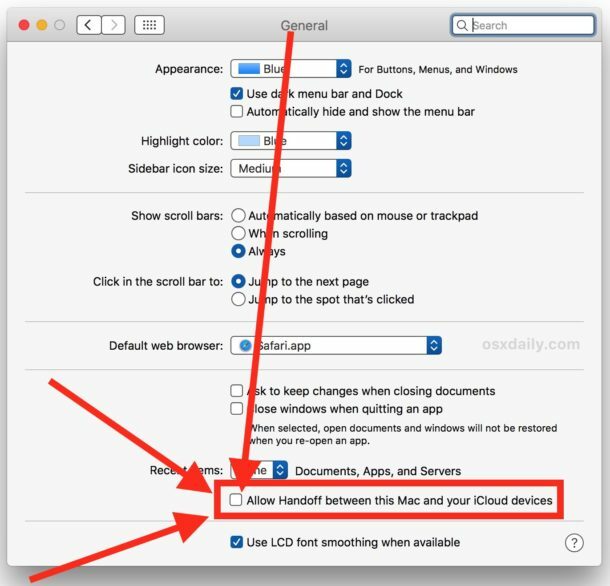 Modern versions of Mac OS default to having Handoff enabled as part of the iCloud and Continuity suite, but if you’re not interested in using Handoff or don’t want it on for some other reason, then you will find it’s very easy to disable Handoff on the Mac. When you disable Handoff on Mac OS, you will no longer see any Handoff icons showing up in the far left side of the Dock when other iCloud devices have app sessions to resume or send to the Mac. Additionally, turning off Handoff on the Mac will lose a few other Continuity features too, but if you’re not using them then you likely won’t miss that. That’s it, there is no need to disable Handoff on other iOS devices or Macs if you simply don’t want them sharing Handoff app sessions with that particular Mac, though if you want to stop the feature completely then you’d want to repeat the disable process on other devices too. While Handoff is excellent in that it lets users transfer and resume sessions within applications between one Mac and other Macs or iOS devices connected through iCloud, if you don’t use it then you might just want to disable the feature. It’s also really easy to turn back on again, so if you change your mind you can simply reverse the setting and use Handoff as you normally would. Keep in mind that by disabling Handoff you will also lose access to Universal Clipboard between a Mac and iOS device and obviously the ability to resume Handoff sessions in iOS as well. If you’re simply disabling Handoff because you aren’t sure how to use it with your Mac and another Mac, iPhone, or iPad, you might want to take the time to learn how to enable and use Handoff on a Mac and iOS, you will find that it’s a great feature that can get a lot of usage, making transitions between working on an iPhone and iPad devices and a Mac much more seamless. I can not find any such settings in macOS Sierra 10.12.6. If you don’t have the setting for turning off Handoff, then you don’t need to disable Handoff because your Mac doesn’t support Handoff. Easy! If your Mac doesn’t have Handoff it doesn’t support Continuity. But you can use third party tool to enable it if you really want to, I have not tested however I recall reading about it here. I don’t have it, with 10.11. I even tried logging into iCloud and setting it up. Nada. Those who don’t see the feature probably don’t have hardware that supports it. Handoff requires Bluetooth LE 4.0. The current version of Sierra doesn’t HAVE this checkbox in the General preferences or any other preferences I can find when I do a search in System Preferences for “Handoff” nothing comes up. Come on guys, you can do better than this. You’re not even using the current version of the OS and you’re putting out incorrect information that serves to do nothing but frustrate the user. DC, actually it does because it’s a feature of macOS. A feature means Apple builds that capability into the operating system. If you can’t find it obviously that means YOU are doing something wrong, or YOUR Mac does not fit the requirements to use Handoff. That’s not anyones fault but your own, you could buy a new Mac if you want that feature, and use iCloud with another modern iPhone or iPad or Mac. But you don’t know what you’re doing so you don’t have access to these abilities. Don’t complain to others because you can’t figure it out. DC, here is your logic; my eggs and toast does not have iOS 11, it’s your fault! Should I complain to you about it? Why doesn’t my cheese whiz container support iOS 11??? DC why are you not informing me of iOS 12 on my donuts?? I found the checkbox in Sierra 10.12.6 General Preferences on my iMac. It was already checked so maybe that is the default. I don’t remember ever doing anything with it. Well I’p running 10.12.6 and it’s right there where it’s shown in the image in the article. I was thinking the same thing, and amazingly these brainiacs somehow skip the articles and end up directly in the comments sections on the web. How do they even manage that? It makes you want to have a survey required to fill out a comment asking questions about the article, like a 3rd grade reading comprehension quiz. Most would fail. Anti-intellectualism is the new ‘cool’ thing! Sigh. I would love to use Handoff for some apps, but I use Outlook for mail and am sick and tired of Apple’s Mail app opening if I open Mail on my iPhone. So I’m disabling it on my Mac. Alternately, I could delete Mail on my Mac, but I have found warnings not to do this. Come on, Apple, let me turn off just part of Handoff. Pretty much the worst feature ever! Has added NO VALUE to my life whatsoever and had caused MAJOR Bluetooth issues with all of my connected devices, constantly disconnecting and eventually Bluetooth completely die. I’ve had to spend countless months with major Bluetooth issues BECAUSE of this feature. Went through hours of rigmarole with Apple Support trying to troubleshoot it (resetting bluetooth software settings, deleting p.list files and reinstalling the OS to death) and I’ve even had to have my new IMAC’s Bluetooth and wireless module and entire motherboard completely replaced. The fact that this feature is ON by DEFAULT is going to cost Apple MILLIONS of dollars in wasted money because of this stupid feature which clearly has ISSUES. Whichever team worked on this, invest a bit more in your QA before causing many customers wasted time, money and grief!